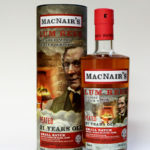 This entry was posted in Blog, New Whisky Releases and Bottlings and tagged 1964, 1966, G&M, Glen Mhor, Gordom & MacPhail, Longmorn, Private Collection, Single Malt on 3 October 2010 by Mike. Distilled on 27 March 1964, Gordon & MacPhail Private Collection Longmorn was matured in cask number 1534 Ã¢â‚¬â€œ a First Fill Sherry Hogshead. Bottled at cask strength (51.9% ABV), 46 years later in summer 2010, just 164 bottles are available for purchase. This single malt is rich and complex with dark chocolate, treacle, marzipan and aniseed aromas wrapped with a resinous, sherried character. The palate delivers sherry wood, mulled fruits and a subtle smoky edge. This whisky was distilled on 1 November 1966 and matured in a Refill Sherry Hogshead (cask number 3687). Bottled in August 2010 at 45% ABV, only 139 bottles have been released for sale. Glen Mhor 1966 is bright gold in colour, with sweet, toffee aromas laced with herbal notes of menthol, eucalyptus and bracken. Toasted oak and vanilla flavours arrive on the palate.